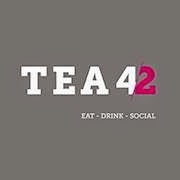 We first spotted Tea 4 2 whilst lounging around one afternoon in Microbar. It was big and shiny and had cakes in the window. Then I forgot all about it. My head has been full of new job, cake, organising cake club and planning trips. And then it came back. So off we trot. 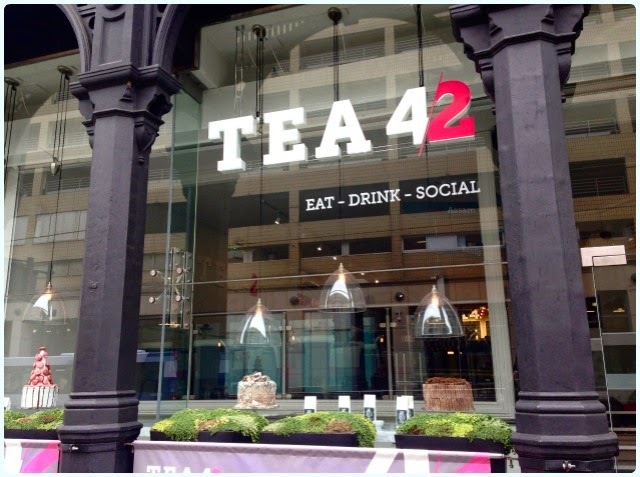 Tea 4 2 is directly opposite the market entrance to the Arndale, and is actually much bigger than I anticipated. 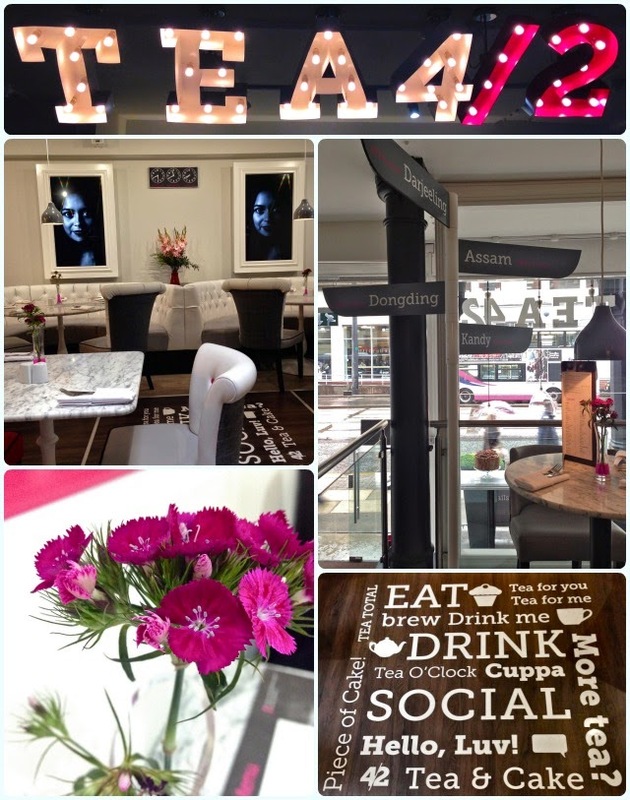 The decor reminds me a little of the Rose Garden in Didsbury, with its clean white furniture and vibrant pink flowers. The styling seems equally important here as the food and drink, and it appears no expense has been spared. Seats and booths are upholstered in white leather with cerise buttons, walls are adorned with artistic lighting and wooden sculptures which allow playful shaped shadows to dance on the walls, and a large bulbed sign above the bar adds a little old fashioned Hollywood glamour. This is not your bog standard tea room. Yes, there is an impressive speciality tea menu, but they also have a full bar, à la carte menu and a decent cake selection. Heavy emphasis is put on standard menu items being accessible to all, including a wide range of vegetarian, gluten free, fat free and dairy free options, making this an ideal spot for any lady who lunches. We went for mid-morning brunch, but already people were coming in to enjoy champagne fuelled afternoon tea too. 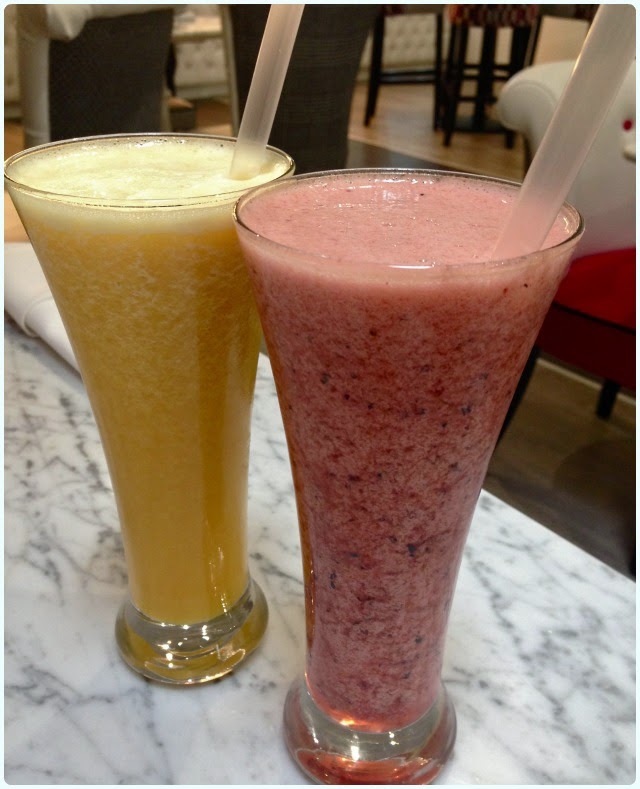 Smoothies: Manchester was boasting one of its dullest of days, with the occasional downpour that would have even had Noah running scared. The Tea 4 2 smoothie menu puts emphasis on healthy, nourishing options rather than the ones that actually end up pushing 500 calories each. My husband had the Jungle Juice; acai, blueberry, strawberry and mango, and I had the Mango Dream. 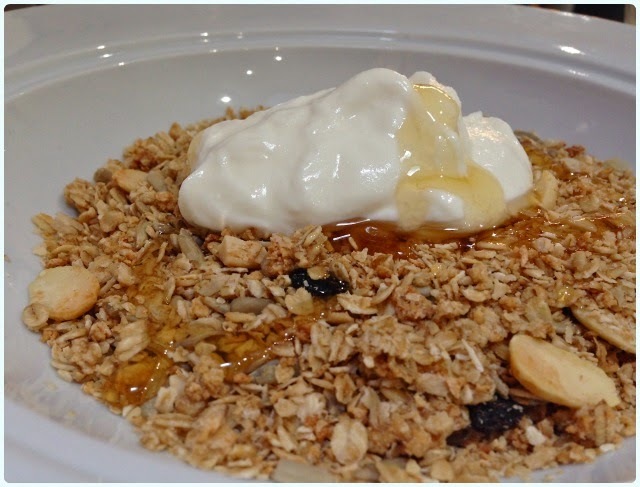 Granola with Greek yogurt and honey: This was delicious. No dusty oats here. A real tummy filler without the added fat. 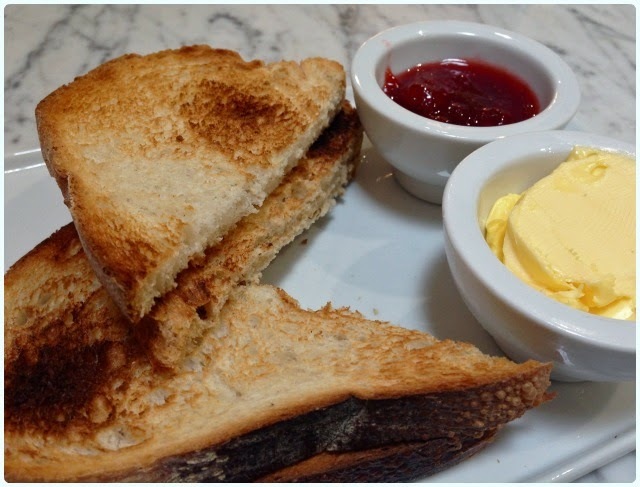 Artisan toast with seasonal jam: This jam is to die for. It's made by a company called Galore! and was the type of runny preserve that looks and tastes home made. My only criticism was that the toast was quite firm and was served with what appeared to be a vegetable based spread rather than butter, which sat on top of the toast and didn't soften it. Cue a million crumbs. Tea: We couldn't leave without sampling their tea. My husband had their Chinese, nut scented Nirvana, which was very pale in colour and mild in taste, but nonetheless very refreshing. I had their Storm in a D Cup; a fragrant Himalayan tea with hints of almond, known as the 'champagne of teas'. This was the perfect blend of strong tea with a sweet edge. Lemon syrup polenta cake: Beautifully zesty with a good sugar crust on the underside. This is perfect for those of you who are not keen on overly sweet cakes, and ideal for coeliacs because it's also gluten free. There was slightly too much syrup in the centre, but the rest of the cake was bang on the money. 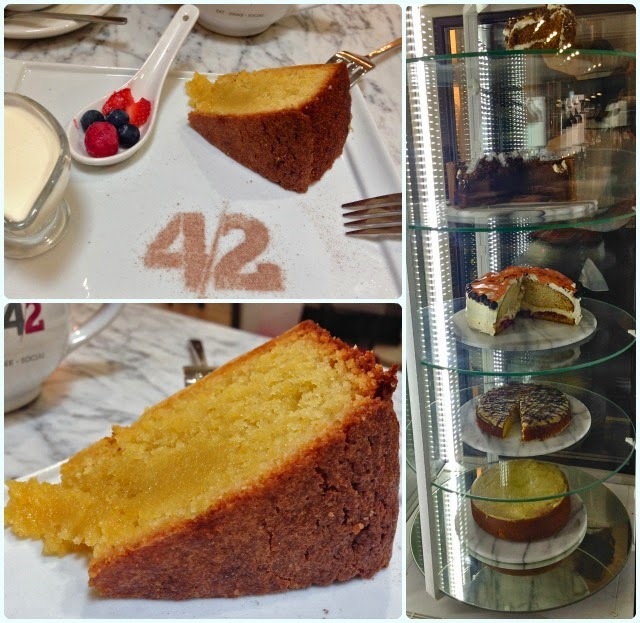 Tea 4 2 is the ideal place to shelter from a deluge, to meet up with friends or to enjoy a lazy afternoon filled with cakes and bubbles. I can already see that we'll pop back here for a well needed cup of tea and a cake, or to sample more of the breakfast menu. Although I've not heard much about this place on the bloggers' grapevine, I'm sure they will be popular in 2014. 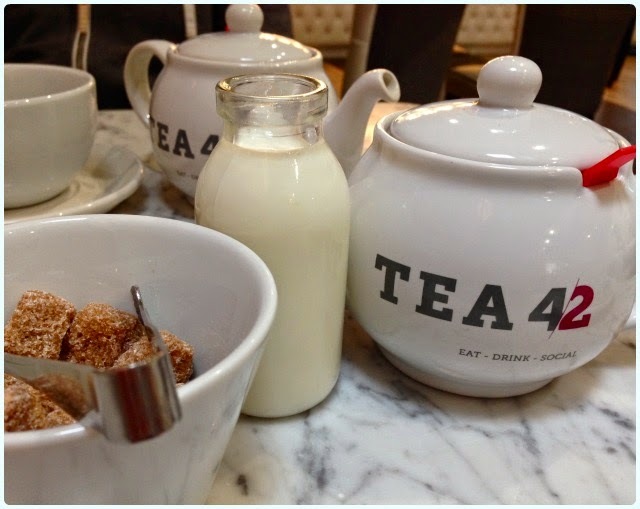 Tea drinkers appear to be on the up, with places like Sugar Junction, Rosy Lee, Richmond and Proper Tea enjoying packed dining rooms throughout the weekend. What it lacks in homely quaintness, it makes up for in it's bold, modern delivery which caters to almost everyone's needs.